The memorial gates commemorate the men from Wellington and district who served in World War One. The beauty spot of Wellington, Cameron Park, in which the monument to the boys who fell overseas is to be erected, is to be further and fittingly beautified by the erection of a set of beautiful gates of bronze and wrought iron. The gates and polished granite columns, five in all, will face Swift street in a direct line down the centre of that street and facing the proposed monument, now in course of erection. In the design are five hexagon columns of polished granite, standing 10ft high. In the centre will be two large gates, and on the sides gates for usual access. 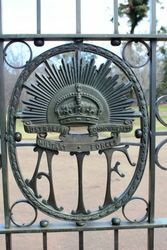 The centre gates are of beautiful design and artistically worked in iron and bronze, and suitably emblazoned, symbolic of the A.I.F. In conformity with the angle of the Crescent, 12ft of wrought iron on stone formation is necessary to carry out the design with the tangent of street line, and so 25 feet of similar fencing will extend on each side of the design, commencing at the columns and extending up and down the Crescent on each side. This beautiful design is the conception of Mr. M. McLeod, and will be most imposing. Mr McLeod is to be congratulated on his public spiritedness in carrying out this work, and the design is undoubtedly a credit to him. In all, the facade will be 80ft in extent, and it is doubtful if there is a country town in the State possessing such an acquisition to their public parks. The noted firm of Messrs. Castles and Co., who are reputed to be the leading firm in the Southern Hemisphere, in this class of work are manufacturing the gates. The granite and stone work will be in the hands of Mr. T. Larcombe, of Dubbo. In all probability the gates will be erected in time for dedication on Anzac Day. Western Age (Dubbo, NSW), 16 March 1923.